Rochester’s bike share program is now in its second year, and it's been quite the success so far. The Pace service – which started as Zagster but was rebranded this year – got a late start last year and ran only for three months, but it counted 22,000 rides in that inaugural season. It started with 310 bikes but has seen enough demand and potential that it now has somewhere between 340 and 370 bikes on the city’s streets, depending on the day. 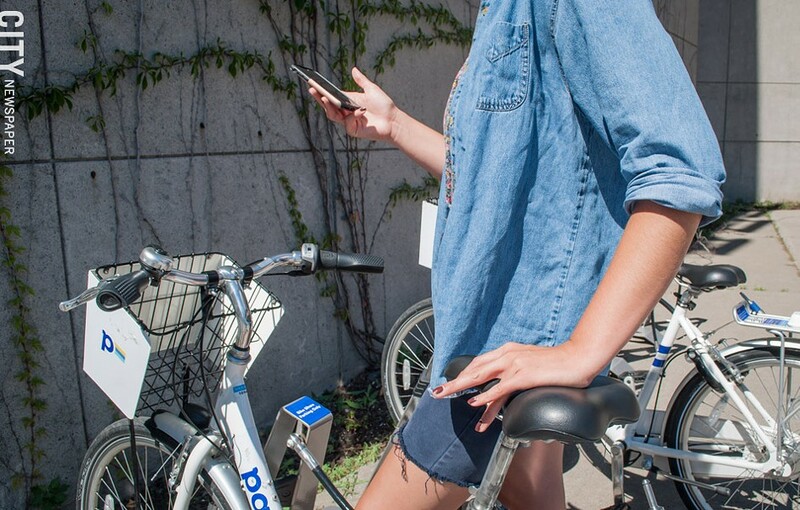 Bicycles in the Pace bike share system must be unlocked using a Bluetooth-enabled smartphone. But not everyone has or can afford a smartphone, so some people are unable to access and use the bikes. And it plans to add an additional 50 to 100 bikes this year. Bicycling has quite a few well-documented health benefits, and with lots of people pedaling the Pace bikes around town, Common Ground Health and the Genesee Transportation Council decided to take a look at the program’s existing and potential health benefits. The organizations recently released their report on that subject – it’s a health impact assessment in technical-speak – and, unsurprisingly, they concluded that the bikes provide serious health and social benefits. It says, by way of example, that cycling for recreation or transportation provides an effective form of exercise and can help combat health problems such as obesity and heart disease. But the report also raises a big red flag on access to the system, which the report says is not equitable. The bikes are more prevalent in the city’s relatively affluent southeast neighborhoods than in its northeast and westside neighborhoods, although the bikes and stations are scattered across the city. The report lays out roughly two dozen recommendations for the bike share system, but one of the most pointed is a call to prioritize the placement of new bike share-stations in low-income census tracts where people have higher rates of chronic health issues. One other pointed recommendation from the report: Pace should find a way for people to rent the bikes without using a credit or debit card, and a way that doesn’t require a Bluetooth-enabled smartphone. “That was the major barrier I was worried about” from Day 1, says Theresa Bowick, a nurse who started the started the Conkey Cruisers neighborhood bicycling program. Not everyone has a credit or debit card, she says, and smartphones are expensive. Pace has already made a big change that allows users to pay with cash instead of a card. Bike users can go into retailers that are part of the PayNearMe network – 7-11, CVS, and Family Dollar are among them – and boost their Pace balance by paying cash. They can then use the Pace app to rent and unlock bikes. The company is still working on a system to rent bikes without a smartphone, says Aviva Manin, Pace’s Rochester market manager. The company is also offering a $5 monthly subscription for public-assistance recipients, she says. Bowick – who was part of the health assessment steering committee – says she’s pleased that Pace is making progress on the payments issue. To be clear, Pace, Common Ground Health, the Genesee Transportation Council, and Bowick all see themselves as partners, not adversaries. The health impact assessment isn’t harsh on Pace; it’s framed constructively. “We’re 100 percent on board with the recommendations that were made and really want to see bike share being an incredible tool to help improve the health of Rochester residents in every part of the city,” says Manin. The assessment was based on Pace’s limited first season, and it’s been in continuous discussion with different groups in the community about how to make the bike-share system better. The company is already trying to make some of the improvements, Manin says. Beyond the payment issue, it’s also paying attention to the report’s recommendations about docking station and bike placement. New stations are in the works in the 19th Ward, Maplewood, and North Winton Village, Manin says. “I do think those two things right off the top were big wins,” says Albert Blankley, Common Ground’s director of research and analytics. The report also tackles the bike-share system’s potential to connect neighborhoods to sources of fresh, healthy food, such as grocery stores and farm markets. “We find that availability and access to healthy food has an immense impact on people’s health and their ability to sort of manage their own health,” Blankley says. Many city neighborhoods with low car ownership – generally lower-income neighborhoods – also lack full-service grocery stores. It can be difficult for people to navigate the transit system for a grocery run, and they have to haul their purchases onto the bus and from the bus to stop to their home. Odds are, there’ll be some distance between the two. Having easy access to the Pace bike share could make grocery store trips simpler, especially when there are docking stations with reliably available bikes right at the stores, Blankley says. And in Pace’s new dockless system, users are allowed to secure bikes to anywhere it’s legal and are no longer required to return them to a docking station. That means users could ride from the store right up to their front steps. One of Pace’s first stations was at the Public Market, and the company consistently made efforts to locate docking stations at grocery stores. It has one at the Tops in the 19th Ward and another coming to the Tops in Maplewood. But Bowick points out that the East Avenue Wegmans does have bike racks, which the Pace bikes can use. Bowick started Conkey Cruisers because of cycling’s health and community benefits. And through seven seasons of rides on the El Camino Trail, which happen several times a week throughout the summer, she’s seen people lose weight, lower their blood pressure, and decrease the amount of diabetes medication they have to take. She also says that biking can help ease pain associated with sickle cell disease. Conkey Cruisers is an incredibly popular program and organization; roughly 300 people register each season, and rides typically draw around 150 people, Bowick says. The sense of community plays a big part of that. But many of the program's health benefits are a result not just of physical activity, but of education. Bowick takes groups for a ride to Wegmans and walk them through safely securing their bikes, gives them a challenge to buy a healthy meal for four people spending only $5, and teaches them about safely transporting things such as meat. The health impact assessment recommends more outreach about the bike share system and its potential health benefits. It also advocates for continued build-out of bike infrastructure in Rochester and for efforts to inform cyclists and drivers about the rules of the road as they apply to bikes. “The education piece becomes critical,” Bowick says.